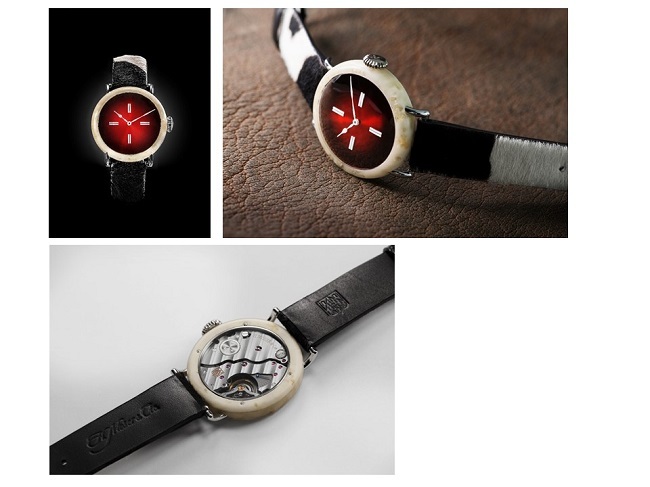 media.h-moser.com :: H. MOSER &amp; CIE. LAUNCHES THE SWISS MAD WATCH: NOT SWISS MADE BUT STILL 100% SWISS – HOLY COW! H. MOSER & CIE. LAUNCHES THE SWISS MAD WATCH: NOT SWISS MADE BUT STILL 100% SWISS – HOLY COW! Created in Switzerland, by Swiss watchmakers and using Swiss materials: the Swiss Mad Watch has symbolic value, tackling Swiss Made debate head on to reveal the truth behind this label. With this unique watch, H. Moser & Cie. demonstrates the importance and urgency of returning Swiss Made to its former heights. Echoing the absurdity and the ridiculous change to the Swiss Made legislation, H. Moser & Cie.'s satirical comment on the issue highlights an alternative resource, 100% natural and entirely Swiss, one of the most precious Swiss resources that exists: cows. The case of the Swiss Mad Watch is created from real Swiss cheese as a base material, a Vacherin Mont d’Or médaille d’or, added to an innovative composite material, itr2©, then machined and polished with the H. Moser signature finishes. For the strap, Swiss cowhide was the obvious choice. The watch is finished with a red fumé dial and doubled indices at 12, 3, 6 and 9 o'clock, subtly reminiscent of the Swiss flag. The result? Stunning, irreverent, astonishing...and completely Swiss! Disruptive? "Definitely," responds Edouard Meylan, CEO of H. Moser & Cie. "Our Swiss Mad Watch sends a clear message to the Swiss watchmaking industry, the authorities and watch enthusiasts: the Swiss Made label is meaningless. Worse than this, it gives credibility to the worst abuses in our industry. Our response to this lax and insufficient label is derision. At H. Moser & Cie., we produce watches that are truly Swiss, watches that are steeped in watchmaking tradition and centuries of experience. The quality of these pieces speaks for itself and dispenses with the need for a label. We are no longer "Swiss Made", but we are Swiss. 100% Swiss, in the case of the Swiss Mad Watch, and over 95% Swiss for all of our other models," concludes Edouard Meylan. H. Moser & Cie. was created by Heinrich Moser in 1828. Based in Neuhausen am Rheinfall, it currently employs 50 people, has eight of its own calibres and produces 1,200 watches per annum. H. Moser & Cie. manufactures parts such as regulating organs and balance-springs, which are used for its own production as well as to supply its partner companies. H. Moser & Cie. is honoured to have a Moser family member with the company as honorary chairman of the board and president of the Heinrich and Henri Moser Foundation. The aim of the Moser Foundation, created by one of Heinrich Moser’s descendants, is to keep the family history alive and seek out antique pieces for the Moser Museum, located in Charlottenfels Manor, Heinrich Moser’s family home. MELB Holding is an independent, family group based in the heart of the legendary Vallée de Joux. With the aim of promoting watchmaking savoir-faire and proven expertise in the field, MELB Holding holds shares in the companies H. Moser & Cie. and Hautlence.